Recently I attended WordCamp Europe 2016 in Vienna – the busy capital city of Austria. Whilst on my way to and from the conference venue I came across these interesting tactile blind accessibility guides at all the traffic light controlled pedestrian crossings. They described each pedestrian crossing in terms of the number of lanes of traffic, or tram tracks, or cycle lanes were to be crossed, and from which direction the cars, trams, bikes would be coming. I was fascinated by how simple they were, but also how this was an amazing statement that Vienna cared for its citizens and visitors. Rather than write a long textual description of how they work alongside the crossing signals I recorded this video to demonstrate. But I have included a transcript, and a detailed description of the individual components further down the page. Recently whilst in Vienna, Austria, I came across a really simple, but really effective accessibility aid at pretty much every street corner. 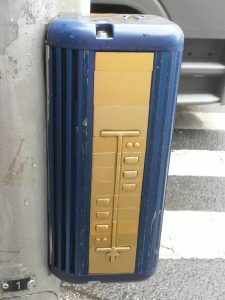 Wherever there was a light controlled pedestrian crossing there was a box like these attached to the traffic light poles. Via touch they help blind and partially sighted people understand what it is that they’re about to cross. They also use sound to draw attention to themselves and to tell people when it’s safe to cross. So how do they work I hear you ask… Well let me demonstrate. The crossing describers attract attention themselves with a regular clicking noise – hopefully you can hear it. This arrow embossed in the top indicates the direction of the crossing. Ooh watch out for the tram. And on the front face there are a collection of these metal panels. Working up from the bottom towards the top, these panels describe the crossing. Right at the bottom there is a vertical arrow – the point of which indicates where I’m standing now. Just above that is a horizontal line which indicates the edge of the kerb. The next two symbols are like equals signs and indicate that there are 2 tram lines – on the first one the trams come from left to right, and on the second one from right to left. This next oval indicates a pedestrian island or refuge. And then I have three solid rectangles which represent three lanes of traffic coming from the right, before I reach the opposite kerb – this horizontal line. The individual metal components are modular and so each crossing can be customised as required. The pace of the clicking has just increased and this is the audible signal that it’s safe to cross. And on the bottom of the box there is a circular panel which vibrates at the same rate as the clicking. I guess that’s useful if you can’t hear the clicking or need reinforcement over the sound of the traffic. As well as the ones shown on this crossing, I also saw this component on other crossings, two dots side by side. These indicate a cycle lane. The pedestrian crossing is active for quite a time – longer than most pedestrian crossings in the UK. Of course sighted users have the green figures on the traffic lights to tell them when it’s safe to cross. Note that when the lights start flashing to indicate that the crossing period is almost over, the clicking becomes intermittent too. And now when the pedestrian lights turn red, the clicking returns to the normal pace. It’s such a great idea – I’m surprised it’s not used in more places. Here I focus on the individual symbol components themselves and describe their appearance and meaning. There may be other symbols on other crossings but these are the only ones I came across. Within each panel there is a vertical line which indicates the path across the crossing. The symbols are read from the bottom upwards. This one is found at the top of the display and indicates the far kerb. It’s a horizontal bar. The vertical bar that indicates the crossing path disappears into the bottom of the horizontal and does not emerge from the top. This component signifies a tram track where the trams come from right to left. It’s formed of two horizontal lines one above the other – just like an equals sign. The lines are to the right of the vertical path line. This component indicates a pedestrian refuge or island. It’s formed of a flattened horizontal oval, with a dot in the middle. The oval straddles the vertical path line. This component signifies a lane of vehicle traffic approaching from the left. It’s formed by an embossed solid rectangle placed on the left of the vertical path line. This component signifies a cycle lane where the cycles are approaching from the left. It’s formed of two circular embossed dots that are aligned horizontally, and placed to the left of the vertical path line. This bottom component indicates the start of the crossing and the place where I’m standing now. It’s formed of an embossed arrow pointing upwards to a horizontal line. The point of the arrow indicates where I am now, the horizontal line indicates the kerb. The vertical path line start from the point where the point of the arrow and the horizontal line cross. Are these used in other cities? Could they be? I’ve not seen blind accessibility guides to describe street crossings like these in other cities before, but maybe I’ve not been in the right places. They’re certainly not to be found in London and other parts of the UK. In the UK, a shrill siren sound is used on some crossings to indicate when it’s safe to cross,. I was struck by the simplicity of the crossing descriptions, and how the use of modular panels meant that pretty much any crossing could be described using just a small set of components. This would surely help keep down the costs of the system. I think it would be great to have these crossing describers used more widely. The whole world is going video now, and I want to start including videos on the Coolfields Consulting website. But obviously I want the videos to be presented in an accessible player that works on all the major platforms - including tablets and smartphones. So here is my requirements list for an accessible media player. I saw these in Vienna in 2012. Fascinating. I shared a photo I had taken at a meeting today then found this. Have you seen or heard of them in use anywhere else since you posted this? Linda, I was recently in Seville and I found a couple of crossing that had audible tones. But nothing in the same territory as the Vienna ones.